Most pet owners think they have the smartest, most talented animal there is. But in Philadelphia, one cat owner may have proof. Music teacher Betsy Alexander's tabby, Nora, puts paw to key and now, Nora does it for all the world to see, and hear, in a video that's a big hit on YouTube. You might say Nora has purrfect pitch! Nora's been at it for two years now. What got her started? Alexander has a theory. She told Turner she thinks Nora "saw me paying a lot of attention to my students ... and I'm not paying attention to her when I'm teaching them. And she got a lot of attention from the students playing, (from) being down here, around them, and I just think (Nora thinks) 'Here's a way that I can get some of that attention!' "
Alexander's students enjoy playing with Nora. 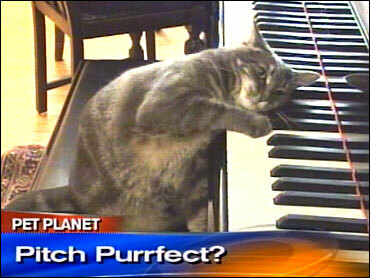 One of them, Michelle Danoff says, "It's pretty cool that I get to play with the famous piano-playing cat. It's a lot of fun!" Of course, no one knows for sure whether Nora is aware of what she's been doing. But Alexander says she's sure Nora is in-the-know: "I think, to her little cat head, it is music. And to me as a composer, I can hear little rhythmic patterns in it, and I can hear little melodic patterns, and I do think she's creating some kind of a sound, or combination of sounds." Asked whether she considers Nora a talented or odd cat, Alexander replied with a laugh, "Both!" Alexander intends to write a book about Nora, and that may not be all. "Lately," Alexander says, "she's been talking more. I will say, 'Nora, do you want to play the piano?' And she will meow. "So, maybe she has a singing career ahead of her!" Alexander chuckled. Nora already has a record deal, with the label Laurel Canyon Animal Company, which has released a CD of songs written around and inspired by Nora's music, "Cat on the Keys." The disc is available at www.petcds.com. For much more on Nora, visit www.ravenswingstudio.com/docs/cats.html. June happens to be Adopt-A-Cat month, and Nora herself happens to have been adopted.